Certified organics from the Winterthur collection: Firebucket, America, 1811; Mourning brooch, America, 1797–1805; Box, England; Box, America, 1780–1800; Mull, Scotland, 1800–1900; Quillwork box, Nova Scotia, 1750–1816. The coconut: it conjures up images of summer luaus and tropical sands, or perhaps it brings to mind the zany sound effects from a certain Monty Python production. There is another intriguing way to envision a lovely bunch of coconuts: as part of the international story of material culture. The hard-shelled fruit has been appropriated by cultures in the tropical zones, found its way onto the tablescapes of wealthy renaissance Europeans, crossed the oceans in the dexterous hands of creative sailors, and even made its way into the collections of major museums around the world. 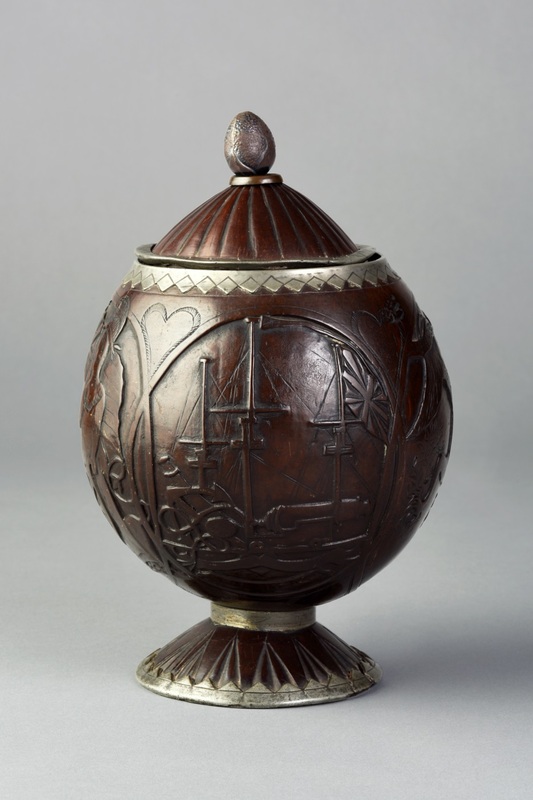 Winterthur houses four coconut shell objects: two ladles, one beaker, and one covered cup. Two of these will be the focus of this post, the start of a series dedicated to the “organics” in our collection. The term “organic” is applied slightly differently in the museum world than it is in modern society. We are used to seeing it plastered across grocery store aisles and on product labels as an indication of the manufacturer’s or farmer’s adherence to standards that restrict chemicals, additives, and mistreatment of animals. When we say “organic” here at Winterthur, we mean the scientific definition: carbon–based compounds derived from living organisms and the modern lab synthesized equivalents. This encompasses a diverse array of materials including wood, feathers, shell, bone, ivory, leather, quills, hair, and even the various fibers used in textile production. Wood and the textile fibers, however, are often separated from this group and studied independently, and our consideration of the collection organics will focus on the remaining materials. A coconut palm (cocos nucifera) produces the fruit commonly known as the coconut. The shell (endocarp) of a coconut, revealed upon the removal of the rough husk, is hard and strong. It has a long history of use for domestic utensils, including serving wares and drinking vessels. Western explorers of the 16th and 17th centuries observed the creative application of the shells by native communities of tropical regions. The Western fascination with the “other” in both human and material forms led many to return with prized coconut specimens of varying sizes and origin, some of which were set with silver or gold and fashioned into high-style tablewares like ladles, goblets, and covered cups. 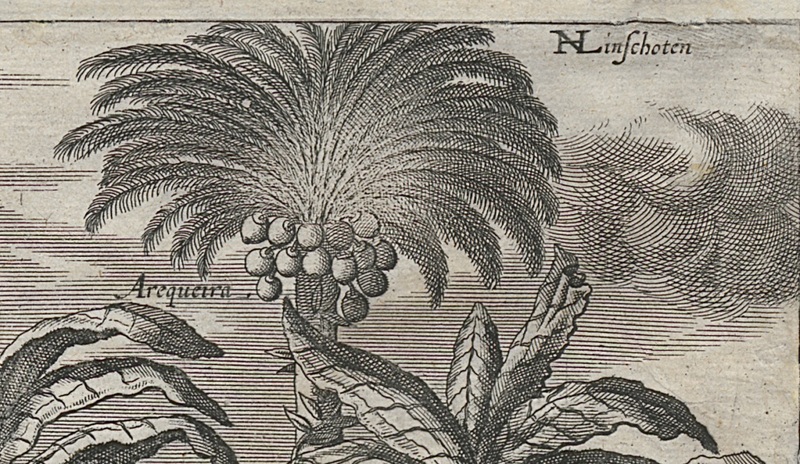 The interest in the exotic coconut continued into the 18th century. The earliest coconut object in the Winterthur collection is a circa 1740–80 ladle. In this case, costly silver was shaped around the rim in a scalloped pattern and applied as a medallion to the bottom of the basin. The lower section of the turned wood handle is encased in silver and joins the bowl with a heart-shaped pad. This petite and refined piece represents the importance of the coconut as a luxurious, exotic material. By the end of the 18th century, the coconut began to lose its novelty. American newspapers advertised massive shipments of the commodity. J. C. Holthuysen announced in the August 26, 1802, edition of the New York Evening Post that he had 1,200 coconuts for sale from a single cargo. J. C. Holthuysen advertisement, New York Evening Post, August 26, 1802. The material remained popular despite its decline of social prestige. Coconuts proved to be a suitable canvas for the creative proclivities of seafaring gentlemen armed with pocket knives. The art of scrimshaw (and the work of the scrimshander himself) often involved the use of materials on hand. 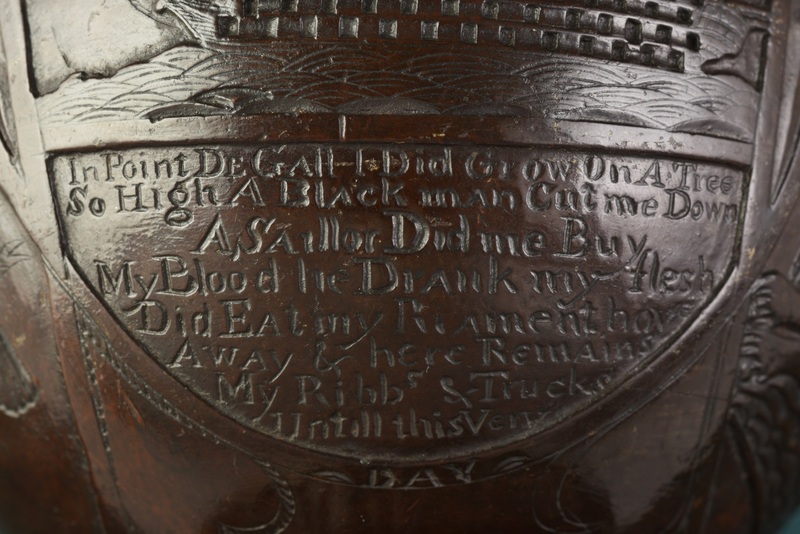 For example, the bones and teeth of sperm whales were intricately carved into small utensils and trinkets and engraved with scenes and portraits by the sailors. The covered coconut cup from the Winterthur collection (shown above) is likely the result of similar carving traditions, albeit with a literary twist. It appears to date circa 1820–40 and features four roundels that intersect around the form, each containing a carving of a ship, allegorical scene, or incised text. 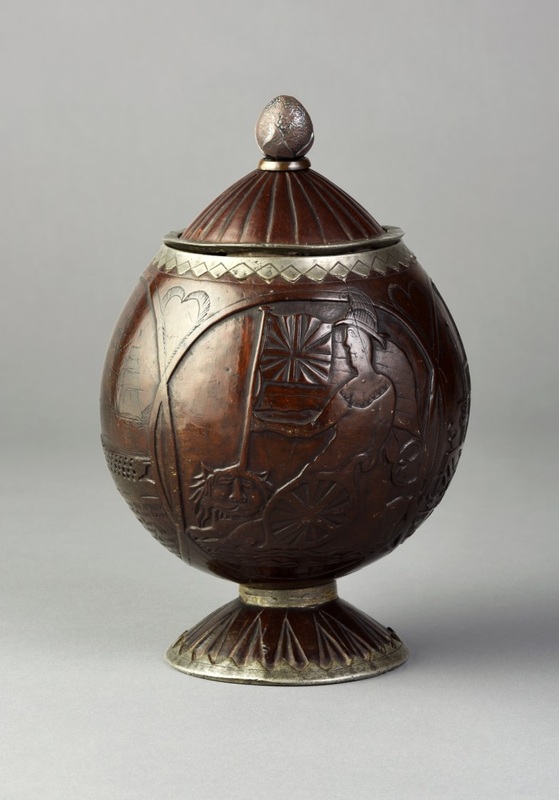 In keeping with the shift in value of the material, this coconut cup is mounted in pewter, including a cast finial. Pewter, although less costly than silver, would have initially shone with much the same splendor, an effect diminished as the metal oxidized over time. Point de Gall refers to the port of Pont de Gall, Ceylon (now Sri Lanka). Pont de Gall was a major coconut export center and a hub for both American and English activity in the region. One side of the cup features a scene showing a female allegory of Britannia ruling the waves from her lion-drawn chariot, holding aloft a sizable British flag. On the opposite side, a version of the American “Great Seal” was carved. Where did the loyalties of the carver lie? Was this the product of a Pont de Gall craftsman attempting to appeal to both markets? The answer remains elusive. The inclusion of a poem is unusual and indicates a degree of fluency in English by at least one of the parties involved in the cup’s creation. There may never be concrete answers about anonymous work, but it remains part of the continuing narrative of creative use of materials, Western appropriation, our fascination with the “other,” nationalism, and the realities of maritime life. Not too shabby for a humble coconut! This entry was posted in Academic Programs, American Culture Studies, Conservation, Decorative Arts, museum collection, Uncategorized and tagged 19th century, coconuts, du Pont, early tools, H. F. du Pont, Henry Francis du Pont, HF du Pont, Joseph Downs Collection, objects, organic materials, Winterthur, Winterthur Garden, Winterthur Library, Winterthur Museum Garden & Library, Winterthur Program in American Material Culture. Bookmark the permalink.